The critics have been proven wrong. Michael Jordan has once again strapped on his powerful wings, and at the brittle age of thirty-eight is amazing crowds and television viewers alike with his fifty-one point performances, his turn-around jumpers and the oh so familiar tongue hanging out down the lane. It's a marvel that a man of his age, after having taken a break for three long years and resting, could come back and play at a level that even our young high school ballers gawk at and remain mystified by to this very day. My inner soul is clawing at me right now, screaming, "No! Don't do it!," but alas I must. This faithful Lakers fan of over twenty years is going to give credit where credit is due - praise a member of a rival team and give him a little of the spotlight that, if age be the criteria for people to unleash the hype, John Stockton has earned and then some. It would be, of course, silly in any way, shape or form to compare the careers or NBA contributions of His Airness to "that guy who's always dishing to Malone." No sane person would say that John Stockton's career, sans ring, even belongs in the same category as Mr. Jordan. I like to consider myself sane, on occasion. Michael Jordan is, of course, not the same Michael Jordan of old. He no longer soars, yet he drifts quite capably. He no longer taunts with words, but instead with cheeky glances after a twenty-footer drops for the fourth time in a row. The media accepts this fact and praises the man for still being able to play the game at the highest level at the age of thirty-eight. 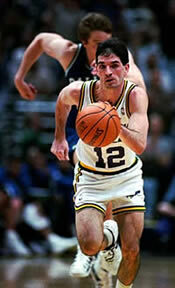 John Stockton will turn forty in March of 2002. Forty! At present, Mr. Stockton (I think he's earned the title) is sixth in the league in assists and twentieth in the league in steals. At forty! His younger compatriots like Jason Williams, Nick van Exel and Stephon Marbury are still chasing the old man, even with their Hip Hop slang, cornrows and colorful tattoos announcing their youth. Michael Jordan most certainly deserves his acclaim for being the greatest player ever to play the game, but when they start talking about how amazing he is at his age, that's when I start thinking that Stockton really does deserve a little bit more recognition. Michael Jordan has retired twice. What this translates into is five full seasons of playing golf, making commercials and selling cologne - in other words, anything but taxing his knees. The fewest games that John Stockton has ever played in a season? Fifty - and that was because the 1998 - 1999 season was only fifty games long! John Stockton is still playing with the youngsters and showing them how it's done two years older than Jordan and without ever having taken a break or rested himself any longer than those early summer months that every kid out there earns, win or lose. So the next time you hear the media praising Michael Jordan's career and ultimate demigod status in the annals of NBA lore, chime in - I will. But when they put it all into perspective by reminding you what an old guy he is, don't forget that little white kid from Salt Lake who's been doing it all along since 1984.